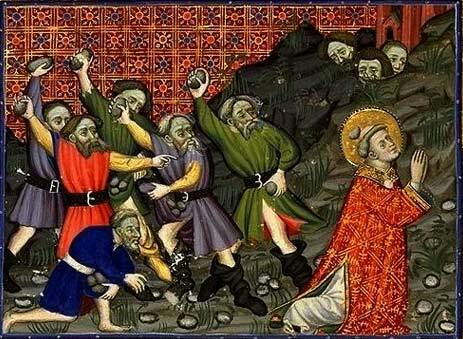 Apparently, St. Stephen wasn’t a big fan of interreligious dialogue or non-judgmentalism. Perhaps if he had tried dialogue instead of proselytizing, things would have been more comfortable for him. But the Second Vatican Council came too late for poor Stephen! Whoa! No, Fr. Grunow, “his own” in the context of John 1:11 does not mean “us” – it means principally the Jews, and to a lesser extent it may refer to unbelieving Gentiles. It absolutely does not refer to Christians. Likewise, St. Stephen’s reprimand condemns the unbelieving Jews, not Christians. It still amazes me that teachers like Fr. Grunow and Pope Francis, while referring to sacred Scripture, just assume they will not be called out on their sleight-of-hand! I say “sleight-of-hand” reluctantly, but I have to believe that these learned men know well the Scriptures and the fathers, and are certainly familiar with the Church’s traditional understanding, but have nevertheless chosen to hide the truth from everyone. A happy, holy Christmas to all! The pontificate of Pope Francis is significant for its extreme impatience with “passive” spirituality, by which is meant spirituality that is too “vertical” and focused on God alone. Also rejected by this papacy is a rudely caricatured “neopelagian” spirituality, perceived as too much concerned with personal holiness and morality, for purposes of pleasing God rather than serving man (i.e., encountering God in “the other”). This impatience is consistent with the anthropocentric trajectory of Modernism, a jealous idol that places man at the center of all religion. But as Pope Paul VI (of all people!) reminds us, the corporal works of mercy – if they are to be meaningful and sanctifying – must be the result of personal holiness and a God-centered life. Otherwise their benefits are merely temporal. 38. It remains for Us now to say a few words about the Modernist as reformer. From all that has preceded, it is abundantly clear how great and how eager is the passion of such men for innovation. In all Catholicism there is absolutely nothing on which it does not fasten. They wish philosophy to be reformed, especially in the ecclesiastical seminaries. They wish the scholastic philosophy to be relegated to the history of philosophy and to be classed among absolute systems, and the young men to be taught modern philosophy which alone is true and suited to the times in which we live. They desire the reform of theology: rational theology is to have modern philosophy for its foundation, and positive theology is to be founded on the history of dogma. As for history, it must be written and taught only according to their methods and modern principles. Dogmas and their evolution, they affirm, are to be harmonized with science and history. In the Catechism no dogmas are to be inserted except those that have been reformed and are within the capacity of the people. Regarding worship, they say, the number of external devotions is to he reduced, and steps must be taken to prevent their further increase, though, indeed, some of the admirers of symbolism are disposed to be more indulgent on this head. They cry out that ecclesiastical government requires to be reformed in all its branches, but especially in its disciplinary and dogmatic departments. They insist that both outwardly and inwardly it must be brought into harmony with the modern conscience which now wholly tends towards democracy; a share in ecclesiastical government should therefore be given to the lower ranks of the clergy and even to the laity, and authority which is too much concentrated should be decentralized. The Roman Congregations and especially the index and the Holy Office, must be likewise modified. The ecclesiastical authority must alter its line of conduct in the social and political world; while keeping outside political organizations it must adapt itself to them in order to penetrate them with its spirit. With regard to morals, they adopt the principle of the Americanists, that the active virtues are more important than the passive, and are to be more encouraged in practice. They ask that the clergy should return to their primitive humility and poverty, and that in their ideas and action they should admit the principles of Modernism; and there are some who, gladly listening to the teaching of their Protestant masters, would desire the suppression of the celibacy of the clergy. What is there left in the Church which is not to be reformed by them and according to their principles? Criticizing the Pope: An F.A.Q. This style has its drawbacks, and I’m sure it gets tiresome for some readers. But it has the advantage of clarifying my own thoughts, and hopefully engaging the subject at a deeper level than you’ll find on most blogs. With the Pope Francis crisis – yes, Pope Francis is a crisis – many issues are percolating, lots of questions are being asked, and orthodox Catholics are being forced to re-evaluate their customary approach to the papacy (and to much else besides). Therefore I decided to put together a short list of Frequently Asked Questions for the purpose of sorting through some of these issues. 1. Why are you criticizing the pope? Don’t you believe he is the Vicar of Christ, the Successor of St. Peter, the Supreme Pontiff to whom you owe filial respect and obedience? This question is the 800 lb gorilla for good Catholics. The pope is our father in the Faith – the word pope literally means “father” – and to us he is also, in the words of St. Catherine of Siena, our “sweet Christ on earth”. A good son always gives his father the benefit of the doubt. A good son inculcates a habit of trust and deference towards his father. If his father has certain undeniable faults, a good son tries to overlook them, to put the best possible construction on them, even to conceal them from his father’s enemies who would exploit them. That would mean not alerting his father’s other children to those same faults, which they may not have noticed. That would certainly mean not blogging about those faults to the whole world. For a Catholic blogger to publish a series of articles that is critical of the Holy Father is an extraordinary thing, to the point where it is perfectly reasonable at first glance to assume the worst of the blogger and the best of the pope. All of the above is true. And if it’s true for ordinary families, it’s even more true for the family that is the Catholic Church. Personality defects of every kind should be overlooked in a pope. Practical incompetence in governing, if it exists, should also be overlooked in a pope (and quietly remedied by those who are in a position to help). To a fairly large extent, even moral failings should be overlooked in a pope and hidden from the public. A certain amount of doctrinal error should be overlooked in a pope – so long as these errors are few, innocently held, and not widely promulgated. Now then, it might happen that a particular fault is so public and egregious that it is impossible to ignore. Still, if a Catholic must oppose his pope in some matter, it should be done with gentleness and filial respect, with every effort to minimize the scandal and to quickly repair the Holy Father’s compromised authority. Sometimes, though, tragic circumstances require extraordinary measures. A natural family might find itself burdened with a father whose cumulative defects pose a grave threat to its members – let’s say he gambles away the family’s livelihood and inheritance – and so a good son may need to warn his relatives, who might otherwise come to harm, while taking measures to defend the family’s inheritance. The Catholic Church, too, might be faced with a pope whose acts are similarly dangerous, and a good Catholic may need to alert his brothers, lest they too come to harm, while taking measures to protect the Church’s inheritance. We face just such a tragedy today with Pope Francis. We should pray and fast that the Lord would prevent the worst, and that public opposition would no longer be necessary, but apart from divine intervention it seems that at least some of us should be speaking out. 2. Why are you trying to be “more Catholic than the pope”? Why don’t you just trust him and go with the flow? I most steadfastly admit and embrace apostolic and ecclesiastical traditions, and all other observance and constitutions of the same Church. I also admit the holy Scriptures, according to that sense which our holy mother Church has held and does hold, to which it belongs to judge of the true sense and interpretation of the Scriptures; neither will I ever take and interpret them otherwise than according to the unanimous consent of the Fathers. I also profess that there are truly and properly seven sacraments of the new law, instituted by Jesus Christ our Lord, and necessary for the salvation of mankind, though not all for ever one, to wit: baptism, confirmation, the eucharist, penance, extreme unction, holy orders, and matrimony; and that they confer grace; and that these, baptism, confirmation, and ordination cannot be reiterated without sacrilege. I also receive and admit the received and approved ceremonies of the Catholic Church, used in the solemn administration of the aforesaid sacraments. I profess, likewise, that in the mass there is offered to God a true, proper, and propitiatory sacrifice for the living and the dead; and that in the most holy sacrament of the eucharist there is truly, really and substantially, the body and blood, together with the soul and divinity of our Lord Jesus Christ; and that there is made a change of the whole essence of the bread into the body, and of the whole essence of the wine into the blood; which change the Catholic Church calls transubstantiation. I also confess that under either kind alone [either the bread or the cup] Christ is received whole and entire, and a true sacrament. I firmly hold that there is a purgatory, and that the souls therein detained are helped by the suffrages of the faithful. Likewise, that the saints reigning with Christ are to be honoured and invoked, and that they offer up prayers to God for us, and that their relics are to be had in veneration. I most firmly assert that the images of Christ, and of the perpetual Virgin the Mother of God, and also of other saints, ought to be had and retained, and that due honor and veneration are to be given them. I also affirm that the power of indulgences was left by Christ in the Church, and that the use of them is most wholesome to Christian people. I acknowledge the holy Catholic Apostolic Roman Church for the mother and mistress of all churches; and I promise and swear true obedience to the Bishop of Rome, successor to St. Peter, Prince of the Apostles, and Vicar of Jesus Christ. I likewise undoubtingly receive and profess all other things delivered, defined, and declared by the Sacred Canons and General Councils, particularly by the holy Council of Trent; and I condemn, reject, and anathematize all things contrary thereto, and all heresies which the Church has condemned, rejected, and anathematized. I do, at this present, freely profess and truly hold this true Catholic faith, without which no one can be saved; and I promise most constantly to retain and confess the same entire and inviolate, with God’s assistance, to the end of my life. And I will take care, as far as in me lies, that it shall be held, taught, and preached by my subjects, or by those the care of whom shall appertain to me in my office. This, I promise, vow, and swear – so help me God, and these holy Gospels of God. These are promises I intend to keep. While this Profession does include a promise of “true obedience” to the Bishop of Rome, it is assumed that “true” obedience can never mean violating any other part of this Profession, such as the vow to “… undoubtingly receive and profess all other things delivered, defined, and declared by the Sacred Canons and General Councils, particularly by the holy Council of Trent” and to “… condemn, reject, and anathematize all things contrary thereto, and all heresies which the Church has condemned, rejected, and anathematized.” If obedience to Pope Francis means that one does not condemn, reject, or anathematize the heresy of Modernism (to use just one example), then such obedience cannot be “true” obedience. The evidence is overwhelming that not only is Pope Francis in the grip of Modernist errors, but he is aggressively communicating these errors to the Church and to the world – although, thanks be to God, without the pretense of magisterial authority. Furthermore he is effectively diminishing the Church’s doctrinal, moral, spiritual and liturgical patrimony in the lives of the faithful, and his administrative actions promise more of the same. I am not concerned with his choice of shoes, car, residence, or vestments; neither am I particularly bothered by his abrasive manners, his simple style of preaching, his lack of theological acumen, or even his garrulous “off the cuff” spontaneity. I believe that he is sincere, not malicious, and that he believes himself to be doing what is best for the Church. But the fact is that the Church is threatened with serious harm by the actions of this pontiff. Do I think of myself as “more Catholic than the pope”? That’s the wrong question. The question is whether I am a faithful Catholic, period, and whether being a Catholic in my particular state of life justifies speaking up in a crisis like this. 3. What do you hope to accomplish by blogging about this? I pray that God directs the right people to read it, and steers the wrong people away from it. I hope that those who do read this blog will be sufficiently alarmed to take action of some kind, to resist error and promote the truth exactly as the magisterium of the Church has taught for centuries. I hope that some will be motivated to attach themselves to orthodox parishes and chapels where enthusiasm for Pope Francis doesn’t eclipse the Church’s priority of the salvation of souls. I hope that a few men of influence will be emboldened to address these errors coming from Rome with far greater wisdom, depth, and clarity than I am capable of doing. Finally, I dare to hope that somehow this blog contributes to helping members of the hierarchy – priests and bishops – understand the magnitude of this crisis, so they can respond to these errors in their parishes and dioceses even if they cannot speak directly to the crisis in a public way. 4. Aren’t you afraid of pushing unstable readers towards sedevacantism? I suppose that is a danger, but it doesn’t justify silence in my view. Exposing the abuses of a bad government could push unstable minds towards anarchism or libertarianism, but the problems still need to be addressed. Besides, nothing I have written suggests that sedevacantism is a viable option at this point. 5. You’re starting to sound like a Lefebvrist. What do you think of the SSPX? We attend an SSPX chapel once or twice per month. My thinking is evolving with experience and reading. The SSPX is a mixed bag, to be sure, but their raison d’être seems entirely plausible, Bishop Fellay impresses me greatly, and I appreciate the measured tone of their recent statements. Every day that passes under this pontificate I grow more and more thankful for Archbishop Marcel Lefebvre. This article from Unam Sanctam Catholicam is simply a must-read for any Catholic with a two-bit theological opinion. I myself am chastened. Severely. I don’t think it’s necessarily wrong for a pope to use harsh and judgmental language when appropriate. Some of our popes did, at times, use excoriating language and even insults against the enemies of God, as did Our Lord Himself. All to the good. It’s a matter of prudence and, of course, truth. It’s very important that insults be properly directed and oriented toward the ultimate good of all. They should also be used sparingly. But we are not accustomed to popes speaking so harshly in this Age of Tolerance and Non-Judgmentalism! I don’t remember John Paul II or Benedict XVI using harsh or insulting language, even when it came to the enemies of the Faith. However, Pope Francis has already developed quite a reputation for insulting those with whom he disagrees, to the point where The Pope Francis Little Book of Insults needs daily updating. Christians who are allergic to preachers always have a reason to criticise but the truth is that they are afraid to open up to the Holy Spirit. And this is how they become sad, Pope Francis said at this morning’s mass in St. Martha’s House, Vatican Radio reports. “These people claimed to accept the truth of revelation, “but the preacher, preaching, no. They prefer a life caged in their precepts, in their compromises, in their revolutionary plans or in their [disembodied] spirituality,” Francis said. Now then, don’t you feel inspired? This is a revealing interview with one of the best prelates in Rome today. Note Cardinal Burke’s tangible discomfort in discussing certain topics, the kind of discomfort exhibited by men who are reluctantly constrained by their own honesty. The most important statement of the interview is that Evangelii Gaudium is not, in his opinion, intended to be “a part of the papal magisterium”, which he repeats emphatically, as if to reassure the Catholic world. The interview begins at around 9:00 minutes. Mr. Louie Verrecchio documents for us the obsession with novelty found in Evangelii Gaudium, which Pope St. Pius X describes below with searing accuracy – Oh, how we need a Council of Vigilance!